by James Merrell. Softbound, 463 pages, 5" x 8". 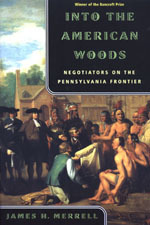 An award-winning historian's beautifully written reconstruction of how Europeans lived in peace and war with Indians on America's colonial frontier. On the PA frontier, the go-betweens were German and Delaware, Irish and Iroquois, French and Shawnee, with names like Weiser, Shickellamy, Mountour and Osternados. These were the "woodsmen", wise in the ways of the American frontier, knowledgable about the other, and able to navigate the treacherous shoals of misunderstanding and mistrust. For many years, they were able to maintain a fragile peace, but couldn't prevent the outbreak of war in the 1750's.